I think it's fun that as a blogger, I sometimes get to experience things I have never tried. 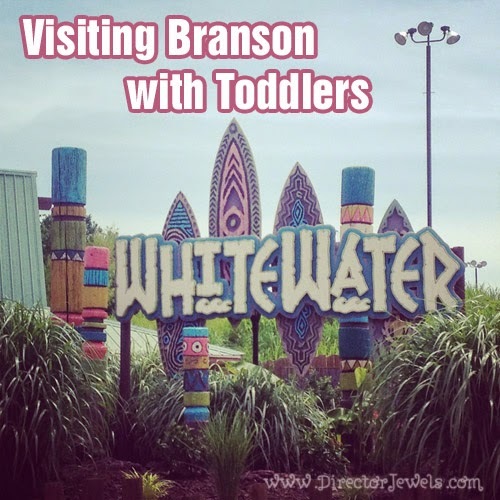 On our Branson family vacation, we were invited to make a stop at White Water, a themed water park that has been in Branson as long as I can remember. I had never been before this trip - and I couldn't believe how much I enjoyed it! 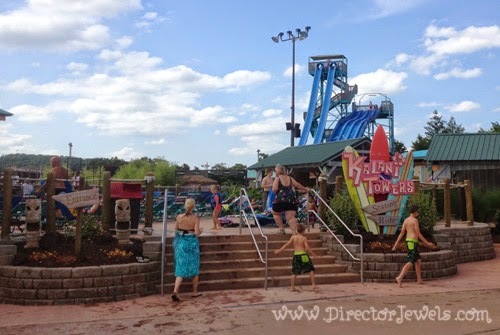 At the end of this post, I'll be sharing 5 Tips for Taking Toddlers to White Water, so stay tuned for that! We arrived at White Water in the afternoon when the sun was shining brightly in the sky. I lathered the kids in sunscreen (in spite of their protests) and we all got suited up in swimwear, then set off to see what fun was in store. 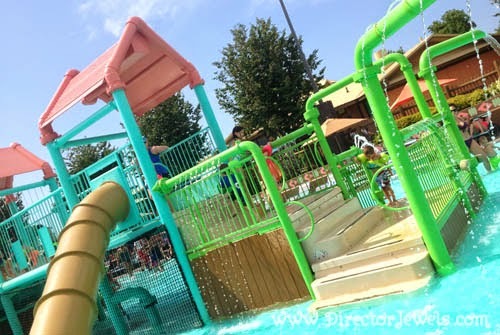 It didn't take us long to spot Coconut Cove, a fenced-off water playground tucked around a corner with only one entrance/exit - so it's easy to make sure your kids don't escape. Lincoln was excited and wanted to check out the big pipes of water and slides right away. It took him quite awhile (probably 45 minutes) to warm up to the idea of the water slides, but once he tried it, he was hooked! He climbed up and waited semi-patiently in line to go on the slides over and over again. We had to remind him a lot to not run on top of the slippery structure. Our visit was on a Saturday, but the crowd was not unmanageable. He never had to wait more than a minute or two for a turn on the slide. Addie was a little more apprehensive about the situation and couldn't make up her mind whether she wanted to be down in the water (which she kept saying was "cold") or carried around. She wanted to explore all of the spraying water and really wanted a turn on the slide, but we decided to wait another summer for that. Since our kids are very little, we stayed with them the entire time, but there are lots of chairs and cabanas (for rent) in this area for parents of those who are able to play more independently. Lincoln would have happily played here the rest of the day, I think! 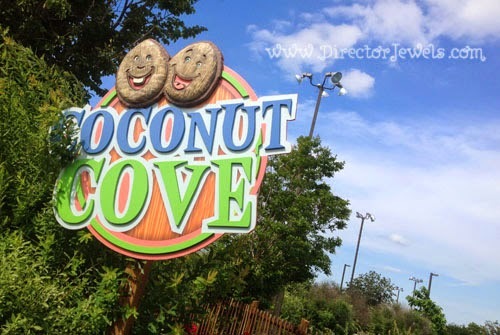 The kids had to be forcibly dragged away from Coconut Cove, but we were eager to find out what other attractions were suitable for the whole family. Our next stop was the nearby Aloha River at Hula Hula Bay. 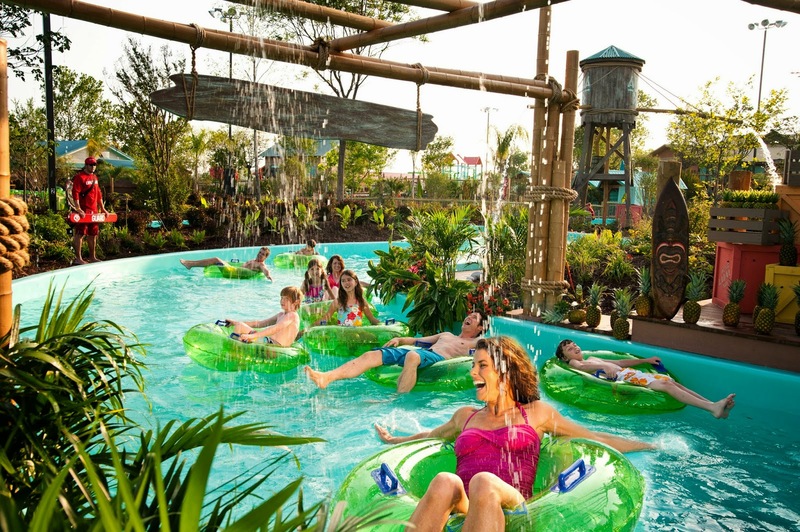 This lazy river ride is more than 800 feet long and holds 300,000 gallons of water. The kids had to wear life jackets, but they were allowed to ride on our laps in the provided tubes. This lazy river was quite popular and we had to wait about five minutes for other riders to exit and pass off their tubes. Lincoln rode with Andrew and thought it was absolutely hilarious to get splashed by the many fountains, misters, bubblers, and geysers along the way. Addie was not as keen on the idea, but she remained happy until we got drenched near the end of the ride. I had no way to steer since I was lying on my back, holding her on my stomach! Overall, this was a very low-key ride that was super fun! I had never been on a lazy river before. Photo Courtesy of White Water. After we disembarked and passed on our tubes to other waiting guests, Addie had had about enough and was clearly ready for a nap. 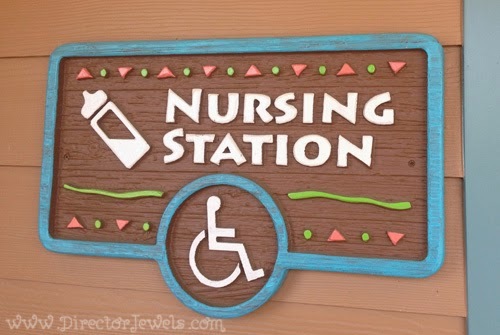 I decided to dry her off and happened upon the Nursing Station between the restrooms near Aloha River. It turned out to be a quiet little oasis with a bench for me to sit on and a changing area that I could use to get her fixed up. Thanks for being mommy-friendly, White Water! I have no issue nursing in public, but when you are wearing swimwear, it's a lot more difficult to remain modest! I was very appreciative of a spot designed with me and my baby in mind. Lincoln happily played with Daddy in Coconut Cove until we decided that it was time to head back to our hotel before the next part of our adventure (Ride the Ducks) was to begin. 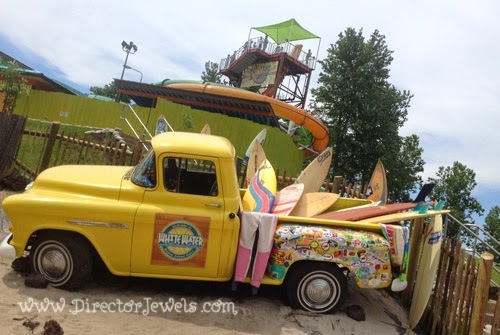 We barely scratched the surface of the fun things available to do at White Water, and I know the kids will want to go back and experience all of the more intense rides when they are older! Kalani Towers is a 300-foot-long drop slide that races at speeds up to 40mph (not for me, thanks). Ohana Falls is a large raft ride that can hold multiple passengers as it careens down a track. 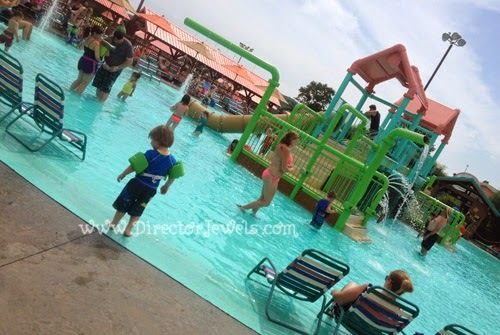 Plus, the Surf's Up Wave Pool is filled with 500,000 gallons of water that's calm until the bell rings - then 4 foot waves erupt and send everyone scrambling! We almost tried the wave pool, since it has a zero-entry water level, but ultimately decided the kids were too tired to tackle it on this trip. 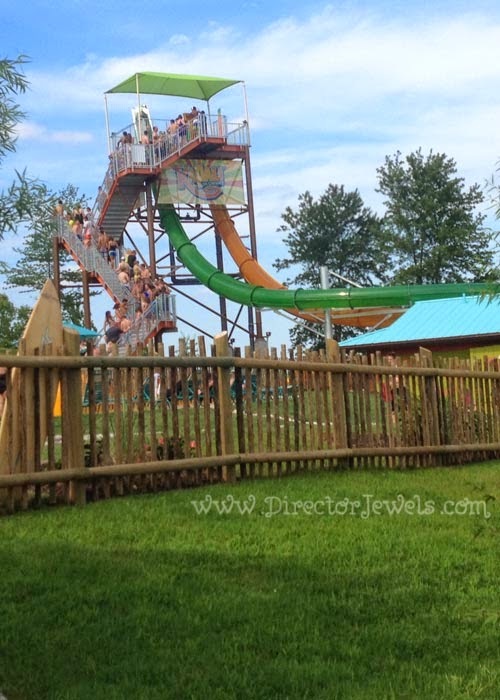 New for 2014 is the biggest thrill ride in White Water history: KaPau Plummet! This brand new ride features two dueling 245-foot slides, each launching riders from a drop-floor into a 70-degree plunge. I don't know that I will ever be brave enough to attempt this one, but something in me says that a teenaged Lincoln will be all about it. Passengers are sent free falling at 26 feet per second before making the final splash. Would you ride it? 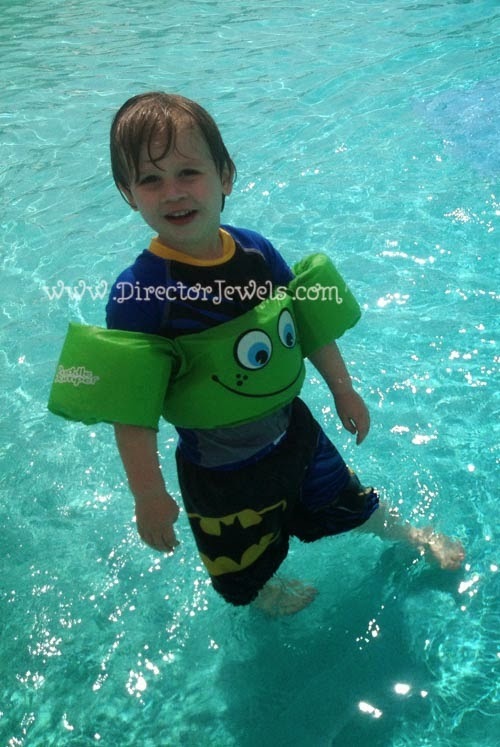 Top 5 Tips for Taking Toddlers to White Water. 1. Free Life Jackets. If you're short on luggage space, leave the life jacket at home. White Water has a huge stash in all sizes (from infant to adult) and they're free to borrow while you're there. 2. No Outside Food Allowed. You can have a picnic outside the park before entering, or purchase food from one of the 5 snack stands on site. 3. The Nursing Room is Fab. Seriously. I already mentioned it, but it makes me so happy when businesses and attractions cater to moms. I'm much more likely to return somewhere if I know it's easy to be a mom while I'm there. 4. 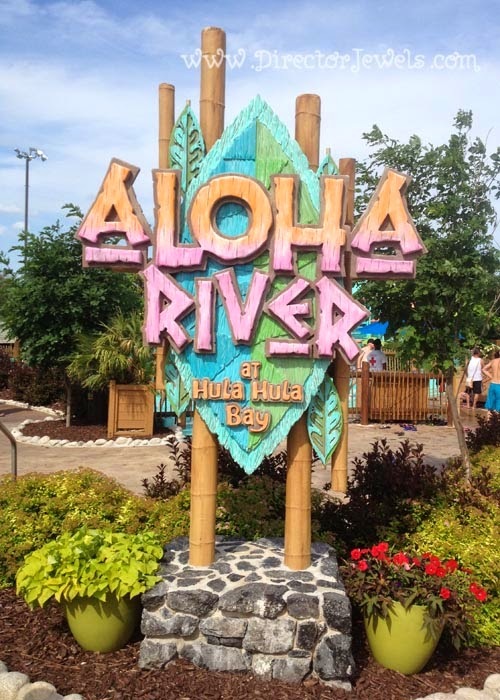 No Minimum Age to Ride With a Parent on Aloha River. As long as kids are wearing a certified life jacket (which are FREE, see tip 1), they can ride on a parent's lap on this fun lazy river. 5. Kids 4 and Under are Free! This was one attraction where I would consider paying a child's admission to visit again because Lincoln had a delightful time. I love that we can visit for close to two more years before we have to pay admission for our kids! You can find out more and purchase tickets to visit White Water here - plus make sure you are following on Facebook and Twitter for all the latest updates!